Conservatory Wind Symphony The Conservatory Wind Symphony is comprised of the very finest wind and percussion students at the Conservatory and is guided by a philosophy that seeks to expose its students and its audiences to the highest quality of music written for wind instruments. Through the rehearsal and performance of this diverse repertoire, students are exposed to a wide variety of compositional techniques, rehearsal processes and expressive possibilities that challenge students to develop their individual musicianship. This wide range of experiences affords the members of the ensemble an opportunity to receive a comprehensive musical education through a demanding and rigorous process of both rehearsals and performances. 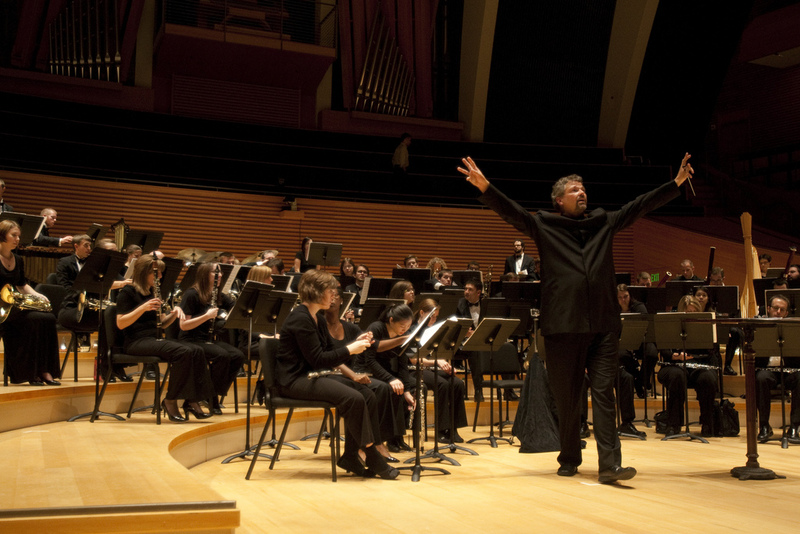 The Conservatory Wind Symphony has a rich history of creative programming and collaboration – a hallmark of its existence. Numerous compositions have been written for this esteemed ensemble by some of the world’s leading composers. In addition, the ensemble regularly collaborates with select student composers found within the Conservatory’s 80 composition majors. The Conservatory Wind Symphony is under the direction of Steven D. Davis.